A fantastical tale of a shy high-school girl whose life is complicated by an emerging set of antlers, when a burning crush inspires her to risk everything. Synopsis: Amber is a teenage girl trying to find herself. With a growing pair of antlers on her head, Amber isn't sure whether to impress her fellow classmates or the animals at the local nature reserve. A crush on a popular boy, Lawrence, pushes her into dolling up to match his clique. They welcome her to their lunch table with open arms, only as a ploy to humiliate her in front of the school and expose her secret headgear. Arriving home, Amber discovers that she has been looking for belonging in all the wrong places. 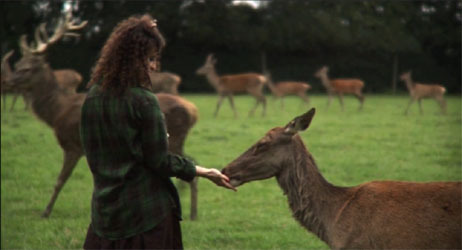 She wanders into the woods where she finds herself fitting in with a herd of deer, finally finding a true sense of belonging. But being one with the world of nature comes with deadly consequences. The clique follow her into the woods and hunt her down for sport. She escapes by the skin of her teeth with the help of an unexpected friend. Lawrence arrives on the scene and drives her to safety. When they are out of harms way he pulls off his hat and shows her she is not alone in her journey. He too has grown a small set of antlers. Together they wander off into the night, ready to take on the world.